KENNEBUNKPORT, Maine — The Maine Superior Court ruled in favor of the town of Kennebunkport in the Goose Rocks Beach lawsuit last week, but the suit is likely headed for appeal according to an attorney representing the beachfront property owners. In a decision handed down last Friday, Judge Wayne R. Douglas’ ruling granted title rights to the town of all beach areas in front of all but one of the 23 plaintiffs’ beachfront properties down to the low water mark. The one exempted property is 29 Sandpoint Road owned by the Temerlin family of LTG Maine Management Trusts. This property is on the very eastern edge of the beach abutting Little River and had a different title history, according to the court ruling. Douglas’ 274 page ruling is the result of an almost 9-year battle over public access to Goose Rocks Beach. In October of 2009, 28 beachfront property owners filed a lawsuit against the town over their property rights at Goose Rocks Beach fighting to halt public beach access. Five litigants have withdrawn since the original suit was filed. But the case, which has cost the town of Kennebunkport $1.2 million over the past 10 years, is likely not over yet. Benjamin Leoni, the Portland-based attorney representing the beachfront property owners, said in a phone interview Tuesday that his clients will likely appeal. “We will be meeting with our clients shortly to make a final decision on an appeal, but I do think it’s likely. We are still looking at our options,” Leoni said. Filed in October 2009, the Goose Rocks Beach lawsuit brought forth by 28 beachfront property owners, claimed the town was violating the rights of property owners by allowing the public to use beach areas that they say were privately owned. The landmark suit split the beach community, with other property owners opposing the legal action and signing a Beach Use Agreement with the town to preserve public access. In October of 2012, a judge in York County Superior Court ruled that backlot owners in the Goose Rocks Beach area and the public have a right to use the beach, citing a longstanding history of the beach being used for a full-range of recreational activities and the town’s involvement in facilitating the use of the beach by the general public. The plaintiffs filed an appeal, and two years later the Maine Supreme Judicial Court overturned that ruling, siding with the property owners. Later in 2014, the town was granted a motion for reconsideration when the Supreme Judicial Court ruled in a new opinion allowing the town to argue its case in Superior Court on a parcel-by-parcel basis rather than the entire two-mile stretch of beach as a whole. Leoni said he likes their chances with yet another appeal. “We’ve been here before. The beachfront owners have lost every decision at every point before the Superior Court, but we have a phenomenal record when we appeal. We are just as confident this time around,” he said. Goose Rocks Beach residents and backlot owners who have fought for public access were thrilled with last week’s court decision. Ann Smith has lived on Bartlett Avenue in Goose Rocks Beach for over 50 years. “It’s a wonderful, wonderful victory. Our children and our grandchildren have spent summers enjoying the beach here and they have made many friendships. We are delighted that will continue. I think all of us are very thrilled. The thing that has been the most difficult is that the beach is just such a joy and to think of losing it, that’s the most difficult thing. I’m thrilled. We have wonderful neighbors, and this has been a very happy turn of events. We are very pleased,” Smith said. Ann Corbey, another Goose Rocks Beach backlot resident, said the Save our Beaches organization, a grassroots group formed by Mic Harris and his wife Sharon Eon, focused on preserving public beach access and worked hard to try to resolve the matter out of court. “This is so exciting for the whole town. The beaches are for everyone,” Corbey said. 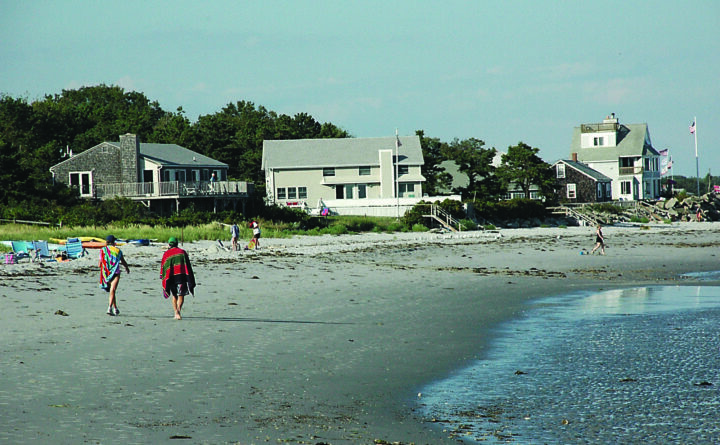 The Beach Use Agreement between beachfront property owners and the town of Kennebunkport was drawn up five years ago as a way for property owners to have certain protections while agreeing to grant permission for the public’s use and remain out of the lawsuit. Tchao said the ruling doesn’t change the Beach Use Agreement for the property owners who have signed it. Tchao said there are 110 beachfront lots and 67 have signed the agreement. The Goose Rocks Beach Advisory Committee oversees the agreement. Under the agreement there is a restricted area that gives property owners the right to enjoy the first 25 feet of dry sand privately. It’s designed to give some respect to private property owners, Tchao said. Tchao said that this case proves that the people who signed the agreement did the most responsible thing. In 2017, three of the original litigants withdrew from the lawsuit and signed the Beach Use Agreement. Tchao commended the court for “its rigorous and thoughtful analysis of an incredible volume of evidence that spanned over three centuries. “As complex as the evidence might seem — it really rests on the simple principle of property that was never conveyed to you in the first place,” Tchao said. Leoni sees it differently and says with the decision the property owners essentially lost some of their rightful property. He said he has received calls from title lawyers concerned with the decision and the implications it brings. The plaintiffs have 30 days to file a formal notice of the intent to appeal.